I thought I'd quickly share what we'll be doing in the next Tuesday class. We'll be heat embossing and discussing different effects that can be achieved using heat embossing. Then we'll be painting our embossed images with bleach. We'll then use inks to colour some of the images. 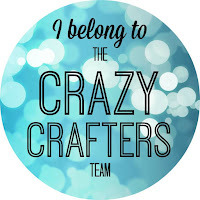 We'll create the top layer (that hopefully brings snowflakes to mind) with the Emboss Resist technique - clear embossing on Whisper White and sponging with Smoky Slate. We'll die cut the ornament shape from the centre of the card (keeping the ornament die cut for another project!). 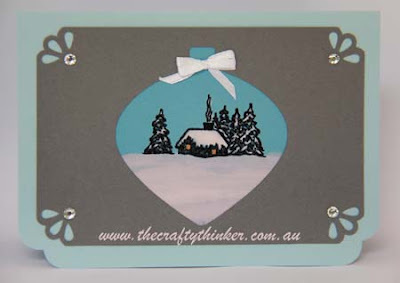 The image from Cosy Christmas is heat embossed with black onto Marina Mist cardstock. Using a small soft brush, household bleach is applied to the trees, roof, windows and chimney smoke. Here I used 4 applications of bleach, drying with a heat tool between applications to check on the level of bleaching achieved. I heated from the back of the paper to preserve the embossing. I also applied bleach to the foreground to look like snow. I painted it onto the card in a streaky sort of way to create interest and look more "scenic" and I also applied less bleach closer to the cottage to create some depth. The corners of the card and the spotty layer were punched using the Curvy Corner Trio Punch. 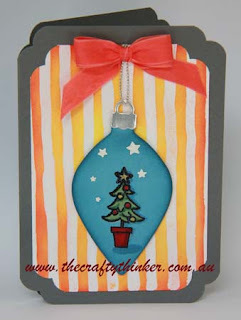 I centred the ornament cut out over my scene, trimmed off any stray edges and then layered it onto the Basic Grey card. I finished it off with a few Rhinestone Jewels and a little bit of white ribbon from my stash. 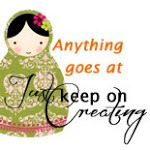 I have entered this into the November link up at Just Keep On Creating - anything goes and it's a fun way to share creativity. Click on the image to have a look. I also made a slightly simpler version without the emboss resist technique - just in case time is tight! You can see that I used more bleach in this one. If time allows we'll also make something like this card which will allow us to colour in our image after we've bleached it. The tree image is from the Santa's Gifts set and I coloured it using Stampin' Write Markers in Pear Pizzazz, Garden Green, Daffodil Delight, Real Red, Chocolate Chip, Hello Honey and Cherry Cobbler. To create the stars, I punch a little bit of left over Dazzling Diamonds Glimmer Card with the Confetti Stars Border Punch and glued on some of the resulting little stars with the Fine-Tip Glue Pen. The emboss resist background is a bit bright but I wanted to offset the rather muted tones in the ornament (I used the same piece of Marina Mist cardstock for both cards to save time!). The colours in the background are Daffodil Delight and Watermelon Wonder. The bow is Calypso Coral Seam Binding Ribbon and the ornament is "hanging" from a little piece of silver Cording Trim. I also made this, slightly more advanced, card using heat embossing and bleach. The images are from Happy Scenes, Wonderland and White Christmas. 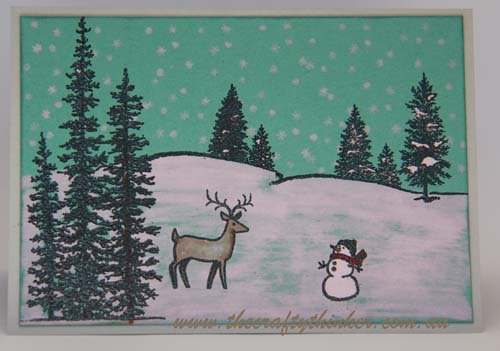 The snow is stamped with bleach using one of the little stamps from Sheltering Tree. To create the trees in the background, I used the same stamp twice but the second time, I masked out one of the trees. 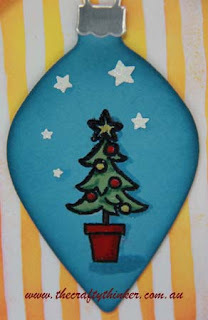 I'll be back soon to show you some cards I've made by "painting" with embossing powder.